The danger of writing a bi-monthly column — or even worse, doing a daily sports-talk show — is that any opinion is nothing more than a snapshot, subject to an instant reappraisal with one new event. I start with that disclaimer today because the offseason of the Eagles is very much a work in progress, but also the topic that interests fans more than any other, including the daily drama surrounding Bryce Harper. People really, really want the Eagles to reinforce their roster and take another run at the Super Bowl this season. 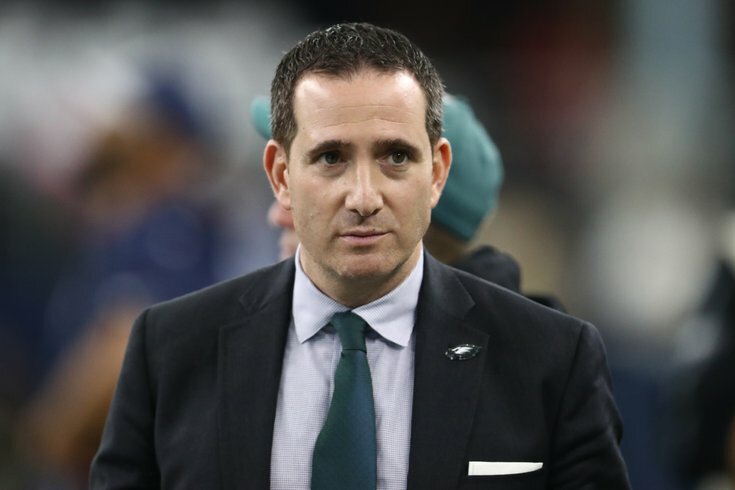 What should the Eagles expect to pay to trade up in the 2019 NFL Draft? But the Birds will not accomplish that goal if the current misguided efforts of this winter continues into spring. That’s right. Howie Roseman, the genius behind the miracle of 14 months ago, is blowing it this time. In fact, Roseman is performing a magic trick right now, misdirecting fans with popular moves that are hiding his far more significant mistakes. The best example is the return of DeSean Jackson, purged during Roseman’s season in exile by Chip Kelly five years ago, amid a torrent of negative stories ranging from a faked burglary to gang ties. Even at his lowest point, Jackson was a fan favorite because he runs almost as fast as he talks. He is, in a word, exciting. Jackson also fills an obvious need, stretching the field on offense, but at what cost? When Roseman traded next to nothing for the temperamental wide receiver, the GM also added to a budget-busting $34-million investment in the wide-receiver position. No one in the media even picked up on the fact that Roseman is spending $32 million more on pass catchers than runners. Meanwhile, since a good argument can be made for bringing back ancient, injury-prone left tackle Jason Peters at around $10 million, fans have shrugged and said, hey, somebody has to protect equally fragile quarterback Carson Wentz. The truth is, Peters is a calamity-in-waiting. He left the field with injuries — are you ready for this? — 11 times in 16 games last season. Let’s get right to the bottom of what has been happening with most of Roseman’s moves this winter. He is making decisions with his heart instead of his head. Jackson is back as one last stab at retribution for Kelly’s calamitous reign. Peters is back because he is close to owner Jeffrey Lurie. And then there are Howie’s beloved high draft picks, Brandon Graham and Nelson Agholor, both of whom rescued their early flops with major comebacks over the past few years. Roseman wasn’t about to turn loose two symbols of his football acumen now, so he committed a total of $13 million to them this season, even though both retrenched in 2018. Incoming: DeSean Jackson, Malik Jackson, L.J. Fort. Outgoing: Nick Foles, Michael Bennett, Jordan Hicks, Jay Ajayi, Golden Tate, Corey Graham, Chris Maragos, Haloti Ngata, Stefan Wisniewski, Jordan Matthews, Mike Wallace and (maybe) Darren Sproles. Would anyone like to argue that the Birds are better now than they were at the end of the season? If so, I’ve got good news for you. Your new order of red-colored glasses is in. So far this winter, Roseman has profited from the popularity of DeSean and Peters, and even more so from the far bleaker efforts of the other teams in the declining NFC East. The Giants have lost not just Odell Beckham Jr.; they have also lost their minds. The Redskins still they have no quarterback. And the Cowboys lost their best third-down receiver, Cole Beasley, who left Dallas for the glitz and glitter of Buffalo. In other words, the Eagles are in position to win back a division title lost last year by bad officiating and too many injuries. But are they ready to tackle the rest of the league? Not right now, they aren’t. The Saints and Rams are better, and the Patriots — with Bennett added to their pass rush — are definitely superior. Hell, maybe the Browns are, too, after all of their stunning moves. What Roseman needs to do, this minute, is abandon every trinket recalling Super Bowl 52, every video he studied of his favorite draft picks, and every pang of sentiment over something that happened 14 months ago. If Howie Roseman wants another parade, he’s got to stop living in the past.